They are the simplest of veggies, cooked in the simplest of ways, but somehow rank among the most delicious and satisfying meals ever. A few accents later, and carrots and broccoli go from a rough, hard-to-chew texture and neutral taste to soft and deep in texture and flavor, with just the right about of bite to keep you craving more and more and more. 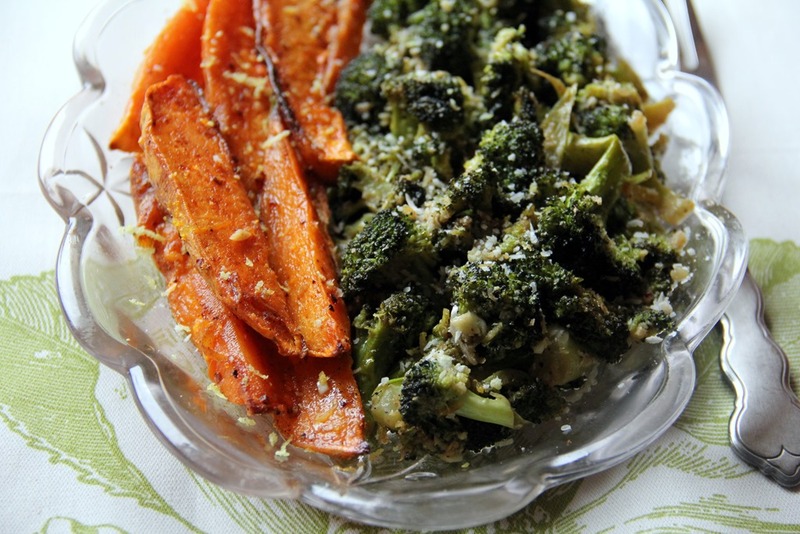 Enjoy this parmesan-crusted roasted broccoli and carrots recipe. Like me on Facebook for regular updates – recipes and more! Broccoli: is packed with potassium, magnesium and calcium, which help regulate blood pressure, contains the recommended daily allowance of vitamin C, fights cancer, contributes to bone health with its vitamin K and calcium content, protects against sun damage, boosts the immune system with its beta-carotene, zinc and selenium, is high in fiber, promotes weight loss, improves vision, and prevents heart disease. Preheat the oven to 400 degrees Fahrenheit. Cut the florets from the broccoli and set aside the stems for use another day. Wash and pat the broccoli florets with a towel until completely dry. 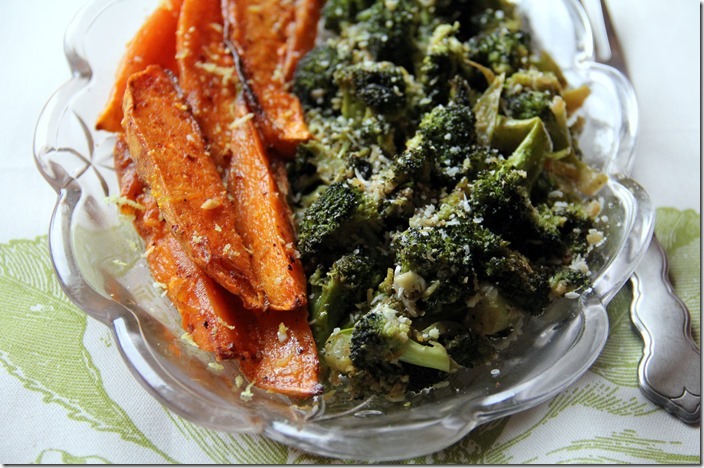 In a large bowl, toss the broccoli florets and chopped carrots with 2 tablespoons olive oil, soy sauce, salt and pepper. Place the broccoli on a cookie sheet and put into the oven for 15 minutes. After 15 minutes, some of the florets should be slightly brown. If you are using a small toaster oven, make sure to leave the oven door open a bit to allow excess steam to escape, just so the veggies don’t become too mushy. 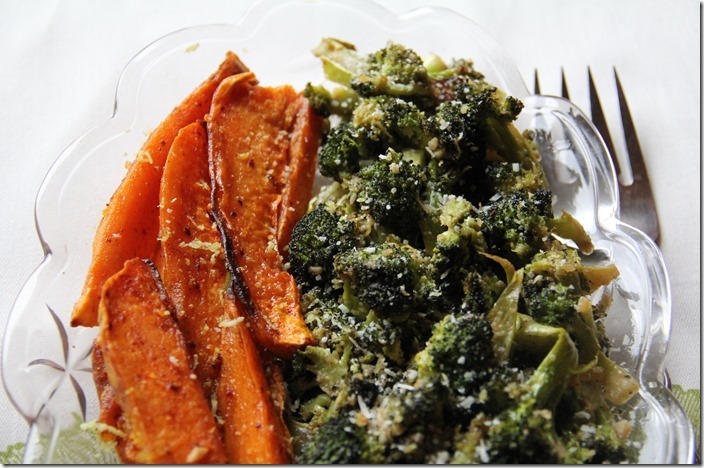 After 15 minutes, take the sheet out and toss the broccoli and carrots with the remainder of the ingredients – lemon zest, parmesan, lemon juice and garlic. Place back into oven again for another 20 minutes until slightly crisped. This entry was tagged broccoli, broccoli recipes, broccoli salad, calories in broccoli, detox recipes, easy healthy recipes, good vegetarian recipes, great vegetarian recipes, healthy, healthy breakfast recipes, healthy dinner recipes, healthy food recipes, healthy recipes, heart healthy recipes, how to become a vegetarian, quick vegetarian recipes, roasted broccoli, simple vegetarian recipes, vegetarian, veggie recipes. Bookmark the permalink. Very tasty and just a hint of crunch! First time I enjoyed broccoli!